I don't even know how to put code into the emulator. Hence why am I so lost. i think if codes were necessary, we would know. repeating "latest version" is a waste of time. if youre mistaken then youll never know because we dont know what you think the latest version is because you declined to tell us. you likely have a hacked up and patched rom. acquire one that hasnt been corrupted by incompetent pirates. So I should use clean US pokemon rom then? I'll try that with my pokemon white then..
never use patched roms with desmume. No, it's better and more up to date. It doesn't require patches to run the game. what i need to prepare sitting ? What works: Everything except network play / WFC / WIFI. Hi i'm new to the forum. I use to play pokemon white like a month ago with desmume 0.9.7 but i stoped playing for a while and when i tried to play again the rom just did not load at all anyone knows how to sholve this???? can i use wifi ? to trade and others?? If anything that I know can help you, then I'm at your service !!! Thank you for this amazing and free DS emulator !! Second, when I enter the road 4, the game screen stay black and never resume. There is no error report for this error. PS: Sorry, I'm French and my english speaking is limited. the game crashes when you don't press a button? It seems the Game Freak Video make it crashes with my White version. I heard the first second and it crashes. But if I press these buttons like a crazy boy, I skip it. 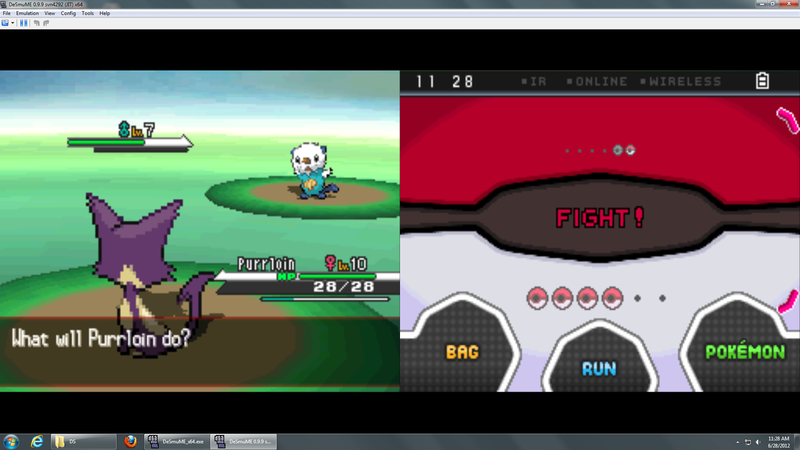 Alright, I've had a couple of problems with getting pokemon white to work. I've got desmume 0.9.7. -redacted- However, when I closed and tried to reopen the game I couldn't. The game wouldn't open from the recent roms section and I was completely unable to find the game file on my computer anywhere. -redacted-. So, if anyone -redacted- I would be very grateful for the help. thanks. This isnt a desmume problem. You should not use patched roms. Quit opening files straight from archives. Find a pokemon gamer's forum for further assistance. Hi I'm having the same problem with a laptop. How did you get this fixed in th end? i just want to say thanks..:) the fix guide works for me.. the cpu usage not raising to 100% anymore.. yay.. the game play become so smooth not sluggish like before.. thanks a bunch guys.. I have googled and googled for 2 hours now and have yet to find a safe/real anti-piracy exp patch for black..lots of garbage pretending to be but not one yet as far as i have seen for the usa version...help please? You're in the wrong forum. Try a pokemon forum. your not using the right key terms, never use the terms patch as it is too general of term, I dont want to drop names of patches as they can be found freely on other sites other than here, this forum is irritated when the read word pokemon thats why im surprised that there is even a thread here talking about it, any ways try pokemon forums when your are looking ofr patches or better yet try to locate code established code site that is open for pokemon not here btw the term is not anti-piracy exp patch. Recently I publicly admitted to being a dirty pirate in a forum that doesn't really tolerate it. I probably should have known better, and will refrain from doing so in the future. Whats missing is the enemy pokemon name, and the number of pokemon left in the enemies' list. Well, I have finished Pokemon Black running in higher resolution without lagging or experiencing crashes. In early installations, there were bugs and improper output of video, however some tweaks on my system did the job.